The National Bureau of Economic Research (NBER), the nation’s arbiter for dating business cycles, is apt to conclude that the recession officially ended in the middle of 2009. Yet consistent job growth has yet to arrive and the unemployment rate will probably not peak until the second half of this year. In short, this recovery is currently “jobless” and has been for quite some time. Worse, even when it is no longer technically jobless (that is, when we have positive employment growth), the unemployment rate will likely not fall substantially for a year or even longer. To many, a jobless recovery and rising unemployment rates occurring simultaneously as jobs return seems contradictory—what is recovery, after all, if not a return to economic security? The simplest (though unsatisfying) answer is that the NBER mostly bases its official end-date of recessions on when output (goods and services) growth, not employment growth, resumes.1 This paper examines the reasons why recovery in employment has lagged far behind recovery of output in recent recessions, and explains why it is quite likely that this long lag between output and employment growth (absent strong policy interventions aimed at spurring them) will happen again. It predicts that it will be many years before the labor market is even as healthy as it was in December 2007. Jobless recoveries happen when growth in gross domestic product (GDP) is too slow relative to the growth of productivity and average hours worked per employee to create jobs. Measured productivity growth often accelerates in the early phase of business cycle recoveries and this reflects the ability of firms to accommodate rising demand for their output without resorting to hiring. How long firms make this accommodation will be a key determinant of how long the current recovery remains jobless. The current recession has been characterized by an even larger fall in total hours worked than in jobs. If employers restore hours for existing employees before hiring new workers, this will result in a longer jobless recovery. The unemployment rate can rise even if job growth returns, as those who exited the labor force (and are therefore not counted among the unemployed) during the recession begin to search for jobs once again. 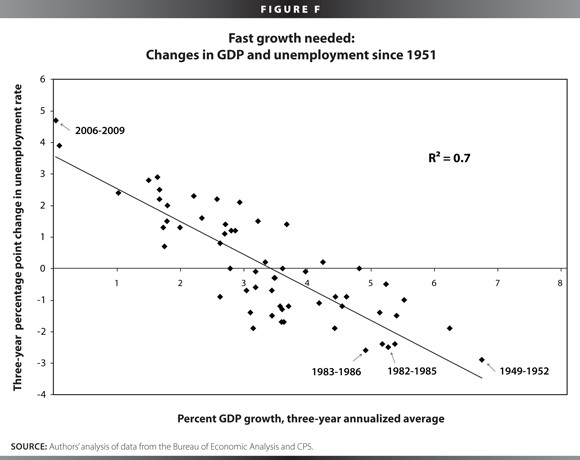 The best cure for a jobless recovery is straightforward: faster GDP growth. The way to implement this cure is to take aggressive action to spur job creation through greater federal spending, transfer payments, and temporary tax credits for firms that expand employment. While the deficit increase needed to spur job creation imposes no significant economic constraint on boosting GDP growth, if political considerations constrain measures to boost GDP growth, then policy makers should seek to maximize both the labor-intensity of given GDP increase (that is, how many total hours of employment growth are associated with a given GDP increase) as well as the job-intensity (that is, how many jobs are associated with a given increase in total hours). Among policies to boost the labor and job intensity of GDP growth are tax credits to firms to either add to payroll or shorten the work week. A new phase in American business cycle? The excruciatingly long lag time between recovery in some measures of economic performance like GDP and recovery in most Americans’ job-market prospects following recessions is a relatively modern phenomenon. After the seven recessions that occurred between 1948 and 1980, the average lag time between the official end of the recession and the return to pre-recession levels of employment was a little over nine months and never took more than a year. Figure A shows employment growth during and after the last three recessions (those starting in the early 1980s, 1990s, and 2000s). In each case it shows how long it took for total employment to recover its pre-recession peak following the official end of the recession. 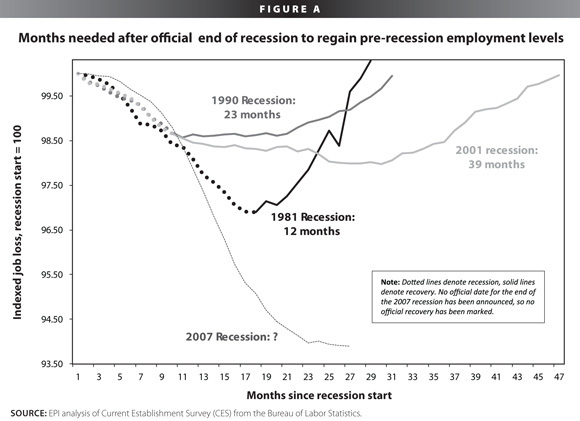 The 1980s recession followed the pattern that prevailed between 1948 and 1980, when the pre-recession employment peak was reached 11 months after the official end of the recession. However, for the next two recessions (beginning in 1990 and 2001), the lag time was much longer. Following the 1990 recession it took 23 months to reach the pre-recession peak; following the 2001 recession it took 39 months. The figure also shows employment in the current business cycle relative to the pre-recession peak and projects how long it would take to regain this peak if it grew at the rates characterizing the past three business cycles. The most hopeful scenario, with employment rising at the rate that characterized the 1980s recession, would see employment regaining its pre-recession peak by September 2011 if this employment growth started in February 2010 (which is an optimistic assumption). If employment grew at the rate characterizing the 1990s and 2000s employment recoveries, this December 2007 peak would be regained in May 2013 and November 2014, respectively (see Figure B). Will job-market prospects recover relatively quickly following the end of the 2008 recession, as they did in the first eight business cycles of the post-World War II era, or will they continue the pattern established in the two most recent business cycles and remain poor for years after the official economic recovery is underway? The next section takes up this question. Back to the 1980s, ’90s, or 2000s? From here, it is easy to see that employment growth can be negative (or flat) even if GDP growth is positive—so long as the sum of growth rates of productivity and average hours rise faster than GDP growth, employment will shrink even as total economic output (GDP) rises.
. 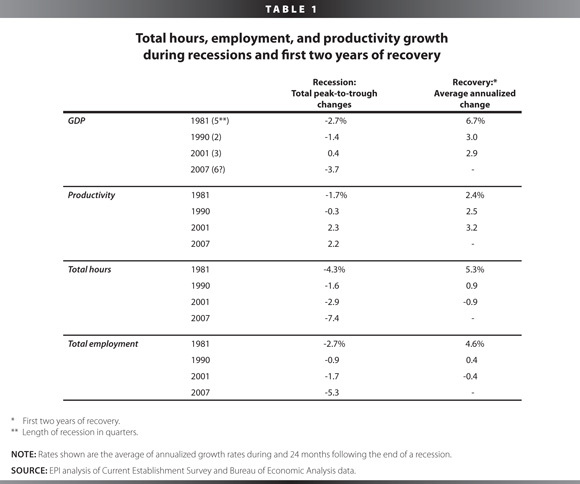 In the 1980s recovery, GDP growth was fast enough to outpace the sum of productivity and average hours growth and lead to rapid employment gains. In the 1990s and 2000s this was not the case. This, in a nutshell, is why we had jobless recoveries in the latter two business cycles. First, a key feature of the early stage of each recovery was an acceleration of measured productivity growth. In the long run, productivity growth is an unalloyed boon—being able to produce more output with a given workforce is the source of rising living standards. However, rising measured productivity growth in the early stage of a recovery is a sign that firms are able to accommodate rising demands for their output without hiring. Hence, how much measured productivity growth surges in the early stages of recovery from the 2008 recession will determine how easily GDP growth translates into job growth. Given this uncertainty about how much productivity growth can allow firms to absorb output growth without hiring, the lesson seems clear: strong output growth is needed for strong employment growth, period. Second, besides the substantial gap facing the economy from the 8.4 million jobs actually lost since the recession began, another gap is the large reduction in average hours worked per week during the recession. If employers can accommodate growing demand for their firms’ output by increasing average hours of their existing workforce rather than adding new employees in the early stages of recovery, this will also provide a powerful drag on job growth. How long can firms boost output without hiring? As noted above, productivity growth tends to surge in the early phases of recovery and dampen employment growth—and this is true in each of the last three recoveries. If one supposes that the recession beginning in 2008 actually ended in June 2009 (this is probably close to where the recession will eventually be officially declared having ended), then productivity growth in the first two quarters of the recovery has averaged a staggeringly high 7.4% annualized growth rate. These productivity growth rates are implausibly high and may well be revised slightly downwards. Yet, evidence from the last half of 2009 suggests that the typical early-recovery spike in productivity seems poised to repeat and may even accelerate faster than usual. If this productivity spike occurs, it would follow a recession that did not experience much of a slowdown in productivity growth relative to the expansion years immediately preceding it. In this sense, the current business cycle is looking very similar to that of the early 2000s. For decades productivity growth in the U.S. economy was generally thought to be pro-cyclical—meaning that productivity fell during recessions and rose during periods of tight labor markets. This meant productivity trends somewhat dampened the negative relationship between employment and output growth over business cycles. As productivity fell just as demand output fell (i.e., during recessions), this meant that firms did not need to lay off as many workers to cope with the downturn. A common interpretation of this pro-cyclical behavior of productivity growth was that firms engaged in “labor-hoarding” during recessions—keeping on workers even if there was not enough current output demanded from them to fully use the workers. This labor-hoarding was often thought to reflect that employers “valued the match” they had made with their employees, calculating that shedding workers during a recession and then re-hiring during expansion imposed costs hefty enough to justify the labor-hoarding during bad times. Evidence of labor-hoarding in the recession can be found in the negative productivity growth rates that characterize the recessions beginning in the 1980s and 1990s. This labor-hoarding does not seem to be a feature of more recent business cycles, as productivity growth remains strong (even relative to long-run trends) over the entire recessions that started in 2001 and 2008. Even worse, the relatively strong productivity growth of the 2001 recession was still followed by a modest acceleration of this growth in the first two years of recovery. In a sense, employment changes were not muffled at all during the recession from decelerating productivity, yet they were muffled during the initial stages of recovery as firms were able to accommodate output growth without hiring. This unfortunate pattern seems poised to repeat: Productivity growth has held up well throughout the recession beginning in 2008 and began accelerating in the last half of 2009. 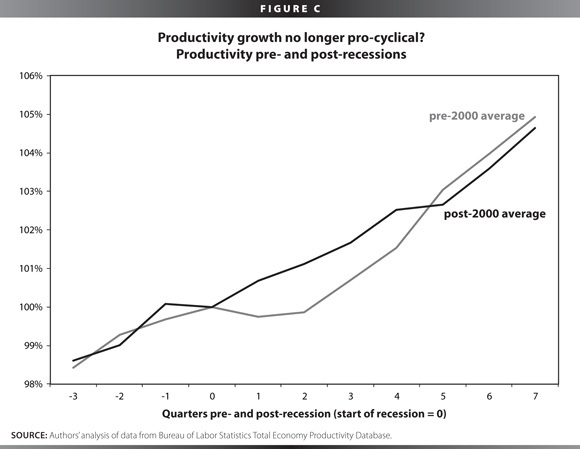 Figure C demonstrates that productivity has become less pro-cyclical over time. It shows the behavior of productivity immediately before and after the start of recessions. The line showing the pre-2000s average of productivity clearly dips down as the economy enters recession and accelerates quickly upward in the early stages of recovery. The line showing the average behavior of productivity in the early 2000s business cycle as well as the current one show no dip at all as the economy enters recession. How bad is the drop in hours? Further, the very large employment declines we have seen during this recession have actually been muted by the fact that average hours per employee have also fallen. 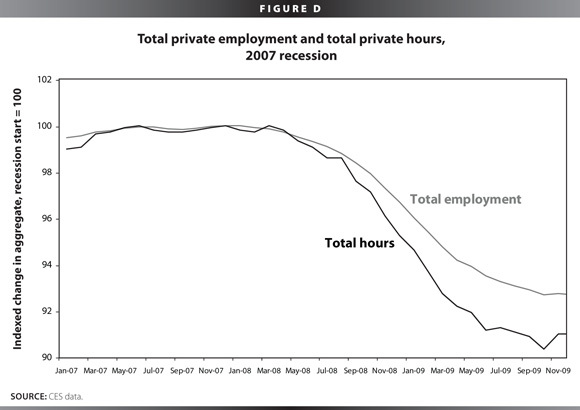 Figure D shows changes in private employment since the start of the recession along with changes in total hours worked by workers in the private sector. Examining total hours worked is more comprehensive, since it captures declines due to both job loss and declining hours for workers who have kept their jobs. Since December 2007, while private-sector jobs are down 7.4%, total private-sector hours are down 9.5%, or almost 30% more. As GDP continues growing as it has in the past two quarters, some of the employment gains that might accompany this output growth will instead be absorbed by rising average hours per employee, as employers restore the hours of their existing employees before hiring new workers. The scope of this issue is perhaps surprisingly large—to simply restore average hours from their current level (33.9 hours per week) to their pre-recession level (34.7 hours per week) at the current level of employment would be equivalent to adding 2.5 million new jobs. With the high productivity growth rate so far in this recession and (possibly) recovery, the large gap left from the sharp decline in average weekly hours worked, and the relatively low projections by most professional forecasters for GDP growth in 2010, we seem certain to continue with consistent output growth, but no real change in the huge jobs hole left by the recession. grew by approximately 4.4 million, and we therefore would have expected the labor force (those who are either employed or actively seeking work) to increase by around 2.9 million over this period. Instead, it declined by around 700,000, indicating that roughly 3.6 million workers dropped out of (or never entered) the labor force during the downturn. Some have withdrawn from it (or never entered) purely voluntarily, deciding to raise children, attend school, or care for a sick relative, for example. However, there are many people currently classified as not in the labor force who would accept a job if one was offered to them. Some have become so discouraged by looking for work that they have simply given up actively trying to land work. The Bureau of Labor Statistics (BLS) tracks those workers, officially classified as “marginally attached” (jobless workers who want a job, are available to work, but have given up actively seeking work and are therefore not counted as officially unemployed). While they seem a small share of the potential labor force (the share of marginally attached workers as a subset of the potential labor force—the actual labor force plus the marginally attached—was only 1.6% in January 2010, up from 0.8% at the start of the recession), much previous research has shown that the line between “in” and “out” of the labor force for those workers not currently employed is much blurrier than the definition might indicate. Several papers (see Schmitt (2002) and Fujita (2007) for two) have emphasized this blurriness by highlighting that roughly half of the workers in a given year taking new jobs were previously characterized as not in the labor force (in particular not classified as unemployed). Further, as Figure E indicates, the labor force participation rate is strongly pro-cyclical—more people begin classifying themselves as active members of the labor force as the economy grows fast, and more begin withdrawing from the labor force as recessions loom. In short, there is much reason to expect that as job growth begins in earnest, there will be a swell of workers back into the labor force. 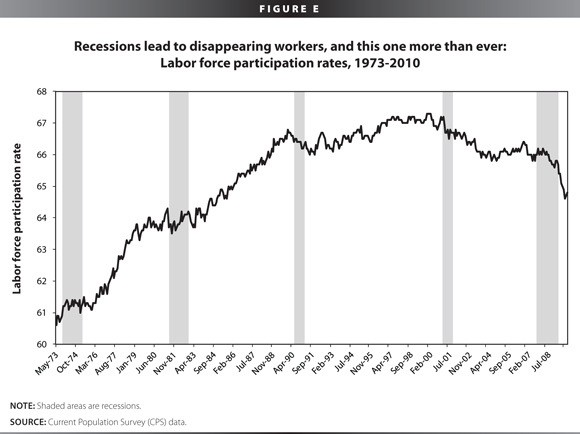 As workers move from out of the labor force to actively searching, they will be newly classified as unemployed. This will keep job growth from translating, one-for-one, into declines in unemployment. Immigration rates respond strongly to the conditions of the U.S. economy. A good portion of the recent decline in the number of people in the labor force can be attributed to declining inflows of immigrants into the U.S. labor force. From 2006 to 2007, the last year of the latest economic expansion, the foreign-born labor force increased by 71,000 per month on average (while the native-born labor force also increased by 71,000 per month on average). From 2007 to 2008, the first year of the recession, the growth rate of the foreign-born labor force dropped precipitously, with the foreign-born labor force increasing by only 6,000 per month on average (while native-born labor force growth did not drop). As the recession deepened from 2008 to 2009, the foreign-born labor force declined by 11,000 per month on average (while the native-born labor force declined by 1,000 per month on average). Declining immigrant flows due to the weakness of the U.S. labor market will likely reverse when the labor market picks up. This means that the number of jobs needed per month to keep the unemployment rate from rising at current immigration rates will no longer be adequate once immigrant flows are restored to or are near their pre-recession levels. 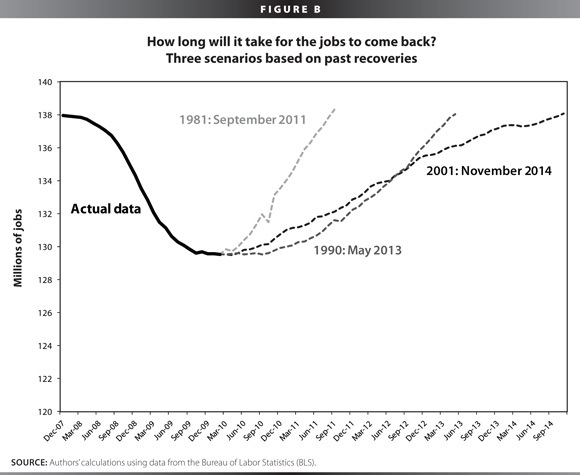 How can we avert (or at least mitigate) a jobless recovery? By now, it should be clear that jobless recoveries are not evidence that the economy works in unfathomable ways, but instead they are the predictable outcome of particular constellations of growth in output, productivity, and average hours worked. The cause of a jobless recovery is simply output growth that is too slow—too slow to absorb workers given the underlying trend growth of productivity and the return to pre-recession averages of weekly hours worked. The simplest solution to this gap is to raise output growth. This is the rationale behind proposals like the American Recovery and Reinvestment Act (ARRA). It is important to note that if productivity growth and average hours growth are outpacing output growth, this means that the economy has large amounts of excess capacity (idle workers and factories). Consequently, efforts to spur output growth (like deficit-financed policy packages like the Recovery Act) can be undertaken without any worry that the economy will run up against any capacity constraints that might cause either inflation or interest rates to rise (see Bivens (2010) for more on this). Occasionally, opponents of using aggressive fiscal policy measures to avoid jobless recoveries will argue that such measures cannot work because fast productivity growth “absorbs” some deficit spending without leading to employment gains. This is not just bad economics, it is bad arithmetic. Remember, the key to avoiding jobless recoveries is simply to ensure output growth outpaces the sum of productivity and average hours growth, period. If this sum is rising unexpectedly fast, then efforts to boost output growth must be redoubled, and these efforts can be redoubled without any fear that capacity constraints will be binding. Presently, this means that another fiscal boost is needed in the U.S. economy. EPI’s American Jobs Plan (2009) is just one example of a plan that has sufficient scale to move the dial on jobs creation even with the fast productivity growth and average hours growth that is likely to characterize the economy over the next year. It also means that there is no excuse for not fighting against the jobless recovery—higher productivity growth and average hours growth indicate that (a) more stimulus is needed and (b) more stimulus is affordable. Can anything help besides more economic stimulus to boost GDP? Outside of proposals to increase output growth, there are other tools that can maximize the job-creation potential of a given level of output—increase the labor-intensity of a given unit of GDP growth (that is, increase the total hours of employment associated with a given increase in GDP) and/or increase the job-intensity of a given increase in labor demand (that is, increase the number of jobs associated with an increase in total hours of work). Policy makers do not want to make increasing the labor-intensity of GDP a long-term strategy, as this reduces measured productivity, and productivity growth is the prime determinant of potential living standards. Yet over the short-term, shaving a percentage point off the productivity growth by increasing the labor-intensity of a given unit of GDP growth will, all else equal, lead to a gain in employment of a percentage point (roughly 1.3 million jobs in the present U.S. economy). Similarly, increasing the job intensity of a given increase in labor demand simply means reducing average hours worked per week. This is also not a policy with no downsides, as reducing average hours worked in the U.S. economy has the potential to harm some workers. Employer-provided benefits (like health insurance) are sometimes offered only to those employees who work a specified minimum number of hours per week. As hours are cut, some workers may drop below these eligibility requirements. In the longer-run, of course, this argues for universal provision of benefits that are not tied to idiosyncratic employment status. ed back half the loss they have suffered since the pre-recession labor market peak instead of the total loss over the next two years, this would result in an extra 1.2 million jobs created over that time. Given the depth of the jobs hole and the political constraints on passing stimulus packages on the scale demanded by the current slump, it seems that policy makers should look seriously at measures aimed at increasing the labor-intensity and the job-intensity of GDP growth over the next couple of years as a job-creation device. Two policies that fit this bill are the temporary job creation tax credit (JCTC) proposed by Tim Bartik and John Bishop in a recent EPI Briefing Paper (Bartik and Bishop 2010) and the Job Sharing Tax Credit (JSTC) proposed by Dean Baker (2009) in a recent Issue Brief for the Center for Economic Policy Research. The JCTC provides a credit to employers to defray the costs of making net new additions to payroll over the next year. In short, for a given amount of output, the JCTC provides a subsidy to employers to produce this output using labor as an input instead of other non-labor inputs. The plan proposes a 15% wage credit for all new additions to payroll and would create the equivalent of 1.4-2.8 million full-time equivalent jobs in the next year at a cost of well under $30,000 per job. The JSTC would provide a credit to employers who reduced average hours worked without cutting average pay. This would help keep average hours from spiking as the recovery got under way and would induce employers to hire more workers for each addition to output than they would have if they could have just spread the extra work among existing employees. Baker (2009) estimates that a JSTC that compensated employers up to $3,000 for reducing work hours could create roughly 1.1 to 2.3 million jobs over the next year, at a net cost of just over $20,000 per net new job. Both the JCTC and the JSTC are hard-sells—subsidizing lower productivity and fewer average hours of work are probably difficult ideas for Americans to embrace. However, they should both be looked at very closely, since GDP growth by itself is very unlikely to create enough jobs to bring the unemployment rate briskly down anytime soon. To drive home this point, Figure F shows the relationship between three-year changes in GDP and three-year changes in the unemployment rate for the post-World War II period. Essentially, it shows that even driving down the overall unemployment rate by 2 percentage points, from today’s 10% to 8%, would require GDP growth rates of 5.3% over the full three-year period. No reputable macroeconomic forecaster is predicting growth this fast in the next three years. While the economy needs faster GDP growth, it also needs to maximize the jobs “bang-for-the-buck” of each increment of this growth. 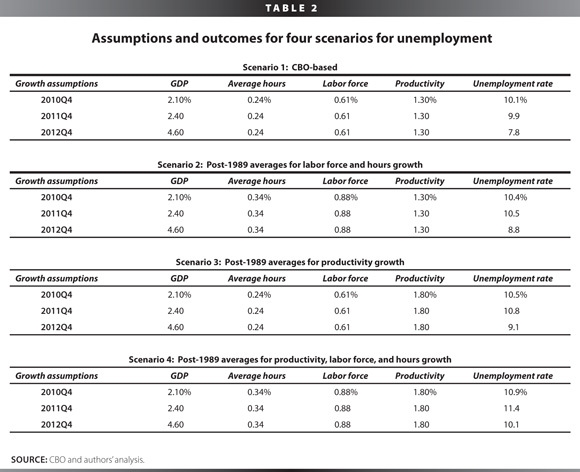 Table 2 projects growth in GDP, productivity, average hours worked, and labor-force growth to illustrate four scenarios for job growth and the unemployment rate over the next three years. These are not forecasts, but an illustration of how grim the labor market picture is for the next three years despite lots of uncertainty over projections of the key variables, including the most important one, GDP growth. 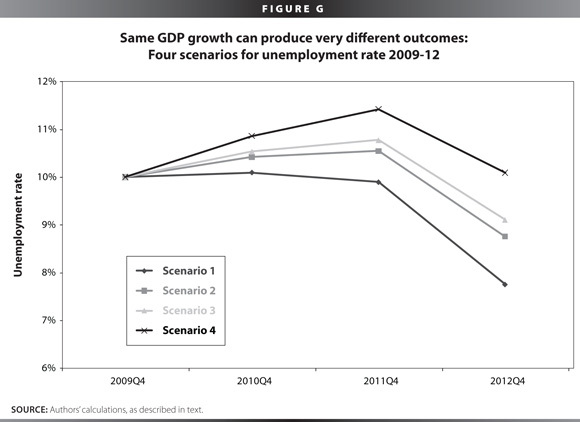 Figure G shows the end-of-year unemployment rates that would prevail in each of these four scenarios. The first scenario is based on Congressional Budget Office (CBO) projections of GDP, the long-run underlying trend of productivity growth, average hours growth, and the growth of the labor force.2 In this scenario, the unemployment rate would end 2010 at the same 10.0% rate that prevailed at the end of 2009. Then it would move to 9.9% by the end of 2011, and 7.8% at the end of 2012. However, since CBO uses trends from only the last business cycle to make projections, this may paint an overly optimistic picture of how labor-force growth and average-hours growth will influence the recovery of the unemployment rate. For example, the last business cycle saw a rather large fall in labor force participation rates even during the expansion phase, while the business cycle of the 1990s saw a rise in these rates. Conversely, average-hours growth was on a slow-but-steady downward trend even before its very large decline starting in 2008. If, however, this downward trend arrests in the next business cycle, as it did in the early phases of the 1990s recovery, the recovery of average hours could dampen employment growth more than anticipated. Given this, the second scenario uses the simple averages of labor-force and average-hours growth based on trends from 1989 to 2007 (two business cycle peaks), not just from the last business cycle. This paints a much grimmer picture of labor market recovery given the GDP growth forecast by the CBO. In this scenario, the unemployment rate would move from today’s 10.0% to 10.4% by the end of 2010, would rise further to 10.5% by the end of 2011, and would stand at 8.8% at the end of 2012. For the third scenario, we examine what would happen if the CBO assumptions on the underlying trend growth of productivity are too low. How much firms will be able to accommodate rising output without hiring (that is, raise productivity) in the early stages of this recovery will be (as it was in the recovery following the 2001 recession) a crucial determinant as to just how “jobless” the current recovery will be. The CBO has assumed that productivity growth will average 1.3% from 2010 to 2014. However, productivity has grown at much closer to 2.0% over the past five, 10, and 20 years. Further, productivity in the non-farm business sector (which tends to grow only about 0.2% faster than total economy productivity) has grown by an average of over 7.0% for the past half-year. While it is sure that 7.0% productivity growth rates will not continue, it is not clear that they will fall all the way to the 1.3% rates forecast by CBO for the next four years, and this past year has provided some powerful (if preliminary) evidence that firms will be able to accommodate substantial output growth without resorting to hiring. Gordon (2010) noted that the very large productivity acceleration following the 2001 recession may have been partly driven by firms that were still incorporating the very large investments in information technology (IT) equipment they made during the late 1990s expansion. This allowed them to sustain rapid output growth without doing much hiring. He argues that since there was no analogous investment boom during the 2000s expansion, it should be much harder for firms to accommodate rapid output growth without substantial hiring. Gordon’s case makes eminent sense, but the extraordinarily rapid productivity growth characterizing the last half of 2009 is hard to ignore and raises the specter of yet another very long period of output growth and employment decline. With all of this in mind, scenario three uses the simple average of productivity growth between the business cycle peaks of 1989 and 2007, 1.8%, to indicate an ability of firms to accommodate output growth without adding to payrolls to a greater degree than CBO currently forecasts. This scenario again generates discouraging results, with unemployment rising from 10.0% at the end of 2009 to 10.5% at the end of 2010, 10.8% at the end of 2011, and 9.1% at the end of 2012.
ual their 1989-2007 averages, we would see unemployment rising from 10.0% at the end of 2009 to 10.9% at the end of 2010, 11.4% at the end of 2011, and would remain over 10.1% even by the end of 2012. We stress again that these are not forecasts, only projections that show how a vast array of unemployment outcomes can co-exist with the same forecast of GDP growth. Policy makers should seriously consider taking out an insurance policy against these pessimistic outcomes, one that consists of further economic stimulus and measures to ensure that GDP growth is labor and jobs intensive. Jobless recoveries are easy to explain arithmetically—they happen when GDP does not rise fast enough to overcome the job-killing effects of productivity growth and rising average hours. What economic forces cause each of these variables to take the specific path that they do in any given time period, however, is much harder to pin down analytically. Though we cannot precisely forecast how these economic variables will behave, we are not helpless in the face of a looming jobless recovery. Policy makers can take steps to boost GDP growth, slow the rate of productivity growth, and/or shorten average hours worked per week in the short term, all of which will add to job creation. Given the importance of the labor market’s health to the living standards of working- and middle-class Americans, and given the dire outlook for this health in coming years, policy makers should start taking these steps immediately. 1. While employment growth is a factor in the NBER business cycle dating criterion, the bulk of their criteria consist of output measures (gross domestic product, personal income, industrial production, and wholesale/retail sales). 2. For GDP, average hours, and labor force growth, the CBO essentially uses the growth rates that prevailed for these variables over the most recent business cycle to forecast their long-run averages. They then assume that the levels of these variables (based on these long-run average growth rates) that would have prevailed absent the recession are regained by 2014. For productivity growth, they combine data on the trend rate of growth with assessments about how recent trends in capital investment will affect the productivity growth rate in the next five years. For this scenario, we take the CBO assumption on yearly GDP growth and on average productivity growth for 2010-14 (1.3%) and then use their procedure for projecting labor-force and average-hours growth to calculate the implied path of the unemployment rate. Baker, Dean. 2009. “Job-Sharing: Tax Credits to Prevent Layoffs and Promote Employment.” Washington, D.C.: Center for Economic Policy Research. Congressional Budget Office. 2001. “CBO’s Method for Estimating Potential Output: An Update.” Washington, D.C.: CBO. Congressional Budget Office. 2010. “The Budget and Economic Outlook: Fiscal Years 2010 to 2020.” Washington, D.C.: CBO. Fujita, Shigeru. 2007. What do worker flows tell us about cyclical fluctuations in employment? Business Economics Review, Philadelphia Federal Reserve. Gordon, Robert. 2010. Okun’s Law, Productivity Innovations, and Conundrums in Business Cycle Dating.” Paper presented at the AEA Session on Business Cycle Dating, ASSA Meetings, Atlanta, January 4. Schmitt, John. 2002. “Labor-Market Transitions and the Measurement of Labor-Market Capacity.” Paper prepared for meeting of the project on “New Cross-National Architecture for Labor-Market Statistics.” Bellagio, Italy, September 23-27.